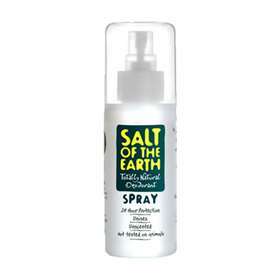 Bioforce Salt Of The Earth Natural Deodorant Spray 100ml is a new formula made from purified honeysuckle water and potash alum, offering 24 hour protection. It is a natural, transparent, fragrance-free spray deodorant. Does not interfere with homeopathic remedies. Spray onto clean armpits from around 10 inches away. Do not use on broken or damaged skin. If irritation occurs, stop using. This product contains salt and may mark some household surfaces. Purified Aqua, Potash Alum, Lonicera Caprifolium (Honeysuckle) Flower Extract, Lonicera Japonica (Honeysuckle) Flower Extract.